Lion numbers are in devastating decline, conservatively measured at a 43% loss over the past 21 years, with 59% in East Africa alone. West African population estimates identify a mere 400 individuals. What little habitat remains (8% of lions’ historic range) is increasingly divided. Ongoing and increasing threats such as habitat loss, a loss of prey species, retaliatory killing and trafficking of lion bone are having a detrimental impact. Hunting trophies dominate lion exports at 42%; because listing regards only commercial trade, and trophy imports are typically imported by private parties, uplisting primarily addresses only lion bone trafficking. Many parties report increasing levels of illegal trade in lion parts and products derived from them.The increasing international trade is likely to have a compound detrimental impact on the species. Listing the species on CITES Appendix I has therefore become an urgent priority. Claims of local community or conservation benefit from trophy hunting are exaggerated. An economic report on trophy hunting from 2013 concludes that hunting companies contribute only 3% of their income to communities living in those areas. The trophy hunting industry was found to contribute only a fraction of a percent to a country’s gross domestic product figure at best. “Nature based tourism does play a significant role in national development, but trophy hunting is insignificant. Across the investigated countries, trophy hunting revenue was only 1.8% of tourism revenues”. 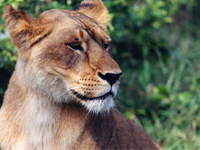 ADI supports clarification that the personal effects exemption does not include hunting trophies. ADI also supports a call to review hunting quotas for all species, many of which have not been reviewed for years. Captive-bred lions have no role in species restoration; captive-bred offspring demonstrate poor survival in the wild. ADI supports a ban on all captive lion breeding operations and a complete ban on all domestic and international trade of lions and their derivatives or products; the only exception being rescue operations of captive animals to sanctuaries accredited consistent with Global Federation of Animal Sanctuaries (GFAS) standards or translocations of wild populations as part of bona fide in situ conservation. The African lion is red Listed as vulnerable but endangered over much of its range and overall declining on The International Union for Conservation of Nature. African population estimated at 18,726-31,394; has been reduced by around 43% over past 21 years. Projected decline of 50% for populations in West, Central and East Africa in next two decades. Threats include indiscriminate killing, trophy hunting, habitat loss, lack of prey and trade in lion parts. These are causing detrimental impact on populations. Trade in 2005-2014: 29,214 items; 4,387 wild-source exports for hunting trophy and 1,701 for commercial purposes; 7,979 lion skeletal parts (e.g. bones, skeletons) exported, of which 1,468 were wild-source; this trade is significant and increasing. Meets criteria for Appendix I - ongoing and projected decline in population size in the wild; small and declining size of national populations/subpopulations; affected by international trade that is or may be detrimental.